I read this article and found it very interesting, thought it might be something for you. The article is called Low Birth Weight, Preterm Delivery Cause Most Newborn Deaths In India and is located at https://archive.indiaspend.com/cover-story/low-birth-weight-preterm-delivery-cause-most-newborn-deaths-in-india-45376. A health worker weighs an infant at a hospital in Agartala, Tripura. Of all infants in India who died before they completed 29 days post-birth, 48.1% suffered from low birth weight and prematurity. The death of every other newborn in India can be traced to either low birth weight (LBW) or premature delivery–a reflection of poor maternal health and an inadequate healthcare system–according to an IndiaSpend analysis of census data. Neo-natal mortality is defined as death during the first 28 days of life. And India reports the highest numbers in the world: As many as 700,000 newborns die in India each year–29 per 1,000 births. This accounts for 26% of neo-natal deaths in the world, according to the United Nations Children’s Fund (UNICEF). Thirteen African countries have better infant mortality rates (IMR) than India, IndiaSpend reported in May 2016. The figures for child mortality, 0-5 years of age, are equally high: Between 1990 and 2015, more children in this age group died in India than anywhere in the world. Despite a 62% reduction in child mortality over these years, the number stands at 1.3 million every year. An infant is said to have LBW when she is under 2.5 kg (5.5 pounds) at birth. A premature or preterm baby is one born alive before the completion of 37 weeks of pregnancy, according to the World Health Organization (WHO). In India, of all infants who died before they completed 29 days post-birth, 48.1% suffered from LBW and premature birth, according to the Causes of Death Statistics, 2010-13 report by the census office. This figure was 35.9% for children under one year of age, and 29.8% for those in the 0-4 age group. These two causes led to the most deaths of children between 0-4 years of age. But between 1 and 4 years, they did not even figure in the top 10 factors, indicating that 0-1 year is the most vulnerable period in childhood. LBW is a complex syndrome caused by two factors–preterm birth and a foetus too small for his/her gestational age. However, the overlap between these two situations has the worst outcomes. There are three underlying reasons for LBW, all traceable to the mother: Poor nutritional status before conception, short stature (mostly due to under-nutrition and infections during childhood) and poor nutrition during pregnancy, Narayan Ramachandran, chairman, InKlude Labs, which helps state governments implement large-scale school-based deworming in India, wrote in the Mint. These points are corroborated by a research involving 350 mothers–conducted by the Rohilkhand Medical College in Uttar Pradesh–to find the epidemiological factors associated with LBW among institutional deliveries. The study revealed the following: 40% of expectant mothers delivered LBW babies and 76.5% of them had a gestational age lower than 37 weeks; 58.5% of these mothers were less than 20 years of age and 76.1% of them weighed less than 50 kg. In 2013, as many as 22 million newborns–an estimated 16% of babies born globally–had LBW, according to the UNICEF. In terms of regional variations, South Asia had the highest incidence of LBW, with 28% newborns weighing less than 2.5 kg. This region also had the highest percentage of infants (66%) not weighed at birth. Sub-Saharan Africa’s incidence of LBW among newborns is estimated to be 13%; and 54% newborns are not weighed at birth. At 28%, India had the third highest percentage of LBW newborns, behind only Mauritania (35%), Pakistan and Yemen (32% each). Except for Pakistan, India performed worse than all its South Asian neighbours. UNICEF, however, has cautioned that the data maybe inaccurate because of under-reporting. There are an estimated 15 million preterm births across the world each year, according to latest available data released by the WHO in 2012. Over 60% of preterm births occur in Africa and South Asia. At 3.5 million, India accounted for the most preterm births in the world, followed by China (1.17 million) and Nigeria (0.77 million). 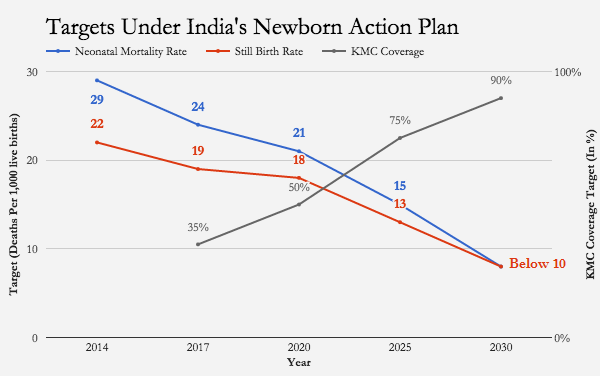 The India Newborn Action Plan (INAP) was launched in September 2014 with the aim of ending preventable newborn deaths and stillbirths by 2030. The plan aims to attain single-digit neonatal mortality and stillbirth rate by 2030. INAP’s main strategy is called Kangaroo Mother Care (KMC). It creates a womb-like environment for the newborn that provides the four basic needs of the baby–Warmth, food, love and protection–and significantly benefits all newborns, especially those who are preterm or suffer from LBW. Generally, KMC is advocated for all newborns weighing less than 2.5 kg at birth. However, in India, because of the huge burden of LBW, INAP has recommended facility-based KMC for newborns with birth weight less than 2 kg on priority basis. India has already cut neonatal tetanus mortality by 99.76% and was declared as maternal and neonatal tetanus-free by the WHO, as IndiaSpend reported in October 2015. The best way to curtail PT/LBW following teenage motherhood is to educate boys who marry young girls below 18.